Beczala selected fascinating and unusual recital for a star, no long evening of cycles, and few "standard recital pieces." The recital consisted of an all Italian first half, and and all Polish second. He began with four songs by Stefano Donaudy that showed him to be in stunning voice. I didn't recognize all of the songs by title, but when he sang them, I had several "aha!" moments. He ended the set with one I knew from an Arlene Auger album, "O del mio amato ben," and it was positively exquisite. Next up; a quartet of songs by Wolf-Ferrari that were sung just as beautifully, even if in his voice they didn't sound particularly Italianate. The songs were wonderfully varied, with one, "E tanto c'e' pericol ch'io ti lasci," whose beginning and repeated theme sound nearly identical to the beginning of "America the Beautiful." It was here we first got to hear Beczala pump out volume that was nearly deafening. One doesn't typically think of this "sized" voice as "loud, but loud it was! Six songs of Respighi followed and they need to be much, much better known than they sadly are. The first half finished with a trio of songs by Tosti that could not have been more fitting, and allowed the tenor to "show off" again, his marvelous technique, thrilling top and his delicious manner of playing to the audience. Delightful. Following intermission came the more serious matter of the songs of his native land. In reading the texts I could barely suppress a gale of laughter; the first half had been comprised of almost all "beautiful days of love . . . perfumed meadows forever in flower . .
kisses, and breezes," and the Polish half began with "wilderness, naked and yellowed, drags its groaning wings over they grey moss . . . your lips are cold . . . what sorrow, unfathomable, unbounded!" Never mind the mood swing, the first set was Six Songs, Op. 2 of Karol Szymanowski, and Beczala sang them, as he did everything, nearly perfectly, with an added, palpable sense of pride. Seven songs of Mieczyslaw Karlowicz followed this, and while less serious in most ways than the previous set, they were more in a traditional "lieder" format even though Karlowicz was only five years older than Szymanowski. Beczala once again lavished great artistry and poured out both volume and passion throughout. The last of these could have been a deleted aria for Lensky out of Tchaikovsky's "Onegin" - I can't imagine this not showing up on more tenor recitals, Polish natives or not. Stunning music. spit out the words with energy and crispness that pointed up the song's fun nature. Martin Katz remains the consummate accompanist, and, in particular, the Polish composers provided him with a thorough workout, most of the songs having long preludes and/or postludes that called for virtuosity and technique to spare. Katz never faltered (has he ever?) and was engaged as thoroughly as his singer. This was true chamber music making. 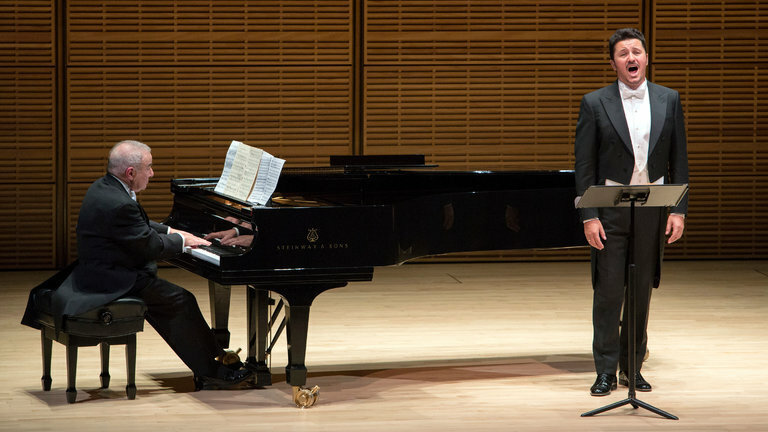 Throughout the recital the strong rapport between these two masterful musicians who've worked together a number of times was made evident at the end of each set, Beczala clasping Katz's hand as the two walked off together, like a beloved uncle and nephew. It was touching to see. Following the predictable ovation, came several encores, all in Polish, the tenor introducing them, like the first, "a favorite of mine, I hope you like." Like we did. After being called back several more times, Beczala ended with the most familiar encore of all time: Strauss' "Zueignung." I told my friend, "The Met is nuts if they don't get on board quickly and mount a production of Szymanowski's "Krol Roger" for Mariusz Kwiecien and Piotr as soon as humanly possible. It would be another much needed hit! Smiles," for that's all anyone could see.